The news that you are pregnant with twins or more can come as a huge surprise. Your emotions might veer between moments of excitement and moments of panic at the thought of double the delight and double the trouble. How will we manage a daily routine with more than one baby? Can I breastfeed more than one baby? Where do we find a pushchair for twins? New parents often find themselves tired, worn out and overwhelmed. It is a good idea to anticipate the challenges that raising more than one baby will bring. Try to organise regular support as early on as you can so you are able to take time to recharge your batteries. You may just need extra help around the house, or a break so you can have much needed time out. HomeStart UK may be able to offer regular support if they have a service in your area. Many mothers expecting twins or multiples wonder whether they will be able to breastfeed. Mothers of twins have found that the increased demand for milk, created an increased supply. You may find it suits you to breastfeed your babies at the same time, but this will probably change as they get older and their hunger patterns change. You can also contact the National Childbirth Trust with any questions on breastfeeding and caring for your twins. There are also a number of very useful websites where you can find answers to your specific questions and also join in discussion groups with other parents of multiples. 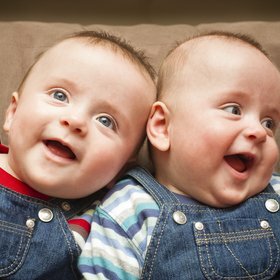 Tamba is a nationwide charity providing mutual support and information networks for parents of twins, triplets and more, as well as for professionals involved in the care of multiples. You can also contact them on Twinline, their freephone number, 0800 138 0509. The Multiple Births Foundation is an independent charity based at Queen Charlotte's and Chelsea Hospital in West London. A vital resource to professionals and families alike, it aims to improve the care and support of multiple birth families through the education of all relevant professionals.